It’s Good to be a Kid! It is a feeling that all of us have. Fear is programmed into us. That’s okay, though, because fear is actually meant to protect us. We are born with a sense of fear so we can react to things or situations that could be dangerous or harmful to our emotional or physical health. Obviously, babies cry when they’re afraid, even if they are startled by a loud noise that is completely harmless—like an older sibling banging drums or something. Babies also experience stranger anxiety and will cling to their parents when confronted by people they don’t recognize. Or maybe strange people like me who make scary faces at them. As babies become toddlers, around 10-18 months old, they start to experience separation anxiety, becoming emotionally distressed when one or both caregivers/parents leave. 4-6 year old kids start to fear things that aren’t based in reality, like monsters or ghosts. …Or Great Aunt Martha’s sloppy kisses and awful casseroles. Okay, maybe that last fear is a real one. Anyway, once kids are 7-12 years old, their fears can reflect real things that could actually happen to them—like getting hurt physically or a natural disaster, like a tornado or something. It’s clear that what kids fear is different than what adults fear. This is due to the many facets of mind development. Children have an incredible imaginative capacity, can repress reason, and also exhibit the condition of innocence. This is played out when a mom is scared of the next medical bill, while her five-year-old isn’t scared of that at all, as long as the medical bill isn’t delivered by the abominable snowman. But as Tim Lott states, in his article “Children used to be scared of the dark – now they fear failure,” fear in children is starting to look more and more like the fear of adults. A recent survey from Johns Hopkins University found that the top five fears of kids thirty years ago were of animals, being in a dark room, high places, strangers and loud noises. But currently, in the updated survey, kids are now afraid of divorce, nuclear war, cancer, pollution, and being mugged. Further, in another poll from the UK, researchers found that some traditional fears like spiders and bugs, witches, the dark, and clowns [eww yes, clowns] are still prevalent among children. But, today the fear of being bullied, being approached by strangers and the fear of failure in school performance are major players. In a society driven by achievement in school that leads to finding a high-paying job, children’s fears are starting to look less innocent and imaginative. And while we could spend a lot of time discussing why this is the case, we’re going to move onto a story in Mark’s Gospel that all about fear and children. Perhaps this story will give us some insights. So here’s the deal: Jesus of Nazareth is traveling with his followers from Galilee to Capernaum. Jesus doesn’t want anyone to know this is happening, because he is afraid [yes, that’s right, I said Jesus is afraid] of how the people might react if they knew he was passing through. He didn’t want to become a king or a religious leader, or a spiritual rockstar. It wasn’t just a fear of the crowds in Northern Galilee, though. Jesus was also concerned about his small band of followers on the road with him to Capernaum. He tells them that he’s going to die and introduces also the possibility of life after death [however you want to define that]. And yet, Jesus knows that his closest friends are afraid of such a possibility. They are confused and fearful of the unknown; so they don’t ask any questions. Instead, their fear leads them to arguing. As they walked to Capernaum, they bickered over who was the best disciple. Who had the most faith? Who did the best work? Who was the most loyal? And…what were you discussing on the road? And the disciples, now afraid what Jesus would think of them, stay silent. Fear is driving this whole story! So finally, Jesus sits down with them, in somebody’s house, maybe his own. And it’s a teaching moment. His disciples still saw the world as a hierarchical structure of kings and queens, religious elites, and then all those below who struggled to survive. And so they sought to move up in the world. But this was not what Jesus called the “kingdom” or “reign” of G-d. This “kingdom” was not top-down. The most venerated politician or religious leader was no different than the no-name beggar on the street. Those of you who receive any of these children like this one receive me. And those of you who receive me receive not me but the one who sent me. The child is a symbol—not necessarily that the disciples should physically receive children and honor them, but that they should receive and welcome the child inside themselves. You see, we say that we value children in society. In the 1st and 2nd century in Israel and Palestine, people said the same things. But children were property and they were cared for by women, who were also considered property. They were bought and sold. And children, for the most part, were not to speak unless spoken to; they were to be seen and not heard. Jesus’ teaching is significant in many ways, but here’s what I’m hearing. First, we need to admit that we are often hypocritical when we talk about children. We say that we love them, we appreciate their cuteness, and we encourage [and sometimes pressure] people to have more babies. And yet, so, so many children are not cared for, not loved, not mentored. Far too many children are born into households of violence, neglect, and abuse. And some children, forced from their homes in Syria, or Honduras, or West Africa, are left to starve and are turned away by governments, religious institutions, and whole countries. These children have done nothing wrong. And yet, as a society we are ignoring them. And secondly, we need to learn to embrace the inner child in us in order to face our fears in a healthy way. There is no reason for us to lose our imaginations. There’s no reason for us to stop laughing at silly things, or to cease exploring or to halt our curiosity. Are your life stories often driven by fear? Are your decisions based out of fear? Do you behave in certain ways simply because you are afraid? From time to time, we may all answer yes to these questions. But we have an opportunity to seek and follow a simpler way, to accept that which we don’t understand or know, and not fear the unknown. To embrace the child in each one of us is to think imaginatively like a child, to move away from fear to trust, love, and wholeness. It is kicking up your feet on an Amsterdam bicycle, just because. All are invited to embrace the inner child, the child who knows that faith is not about certainty, but about wonder; not about answers, but questions. KidsHealth®, © 1995- 2015 . The Nemours Foundation/KidsHealth®. All rights reserved. Jesus said, “Know what is in front of your face, and what is hidden from you will be disclosed to you. Jesus said, “I am the light that is over all things. I am all: from me all came forth, and to me all attained. I spent the last three weeks in the Netherlands. After flying into Amsterdam’s Schiphol airport, my partner Maria and I took a train to the capital of Northern Holland, Groningen. Groningen is a nice little city with plenty of cafes, good coffee, amazing, local cheeses, and canals that wind their way all over the city. 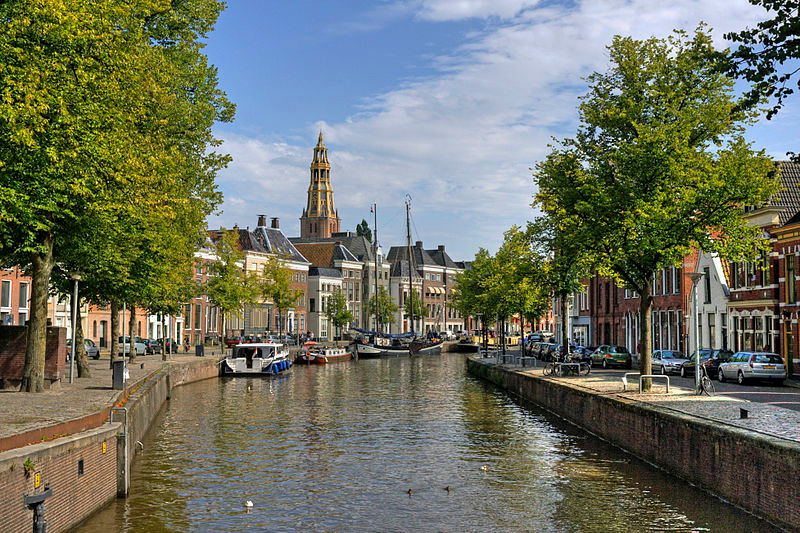 Groningen is also the youngest city in the Netherlands, and one of the youngest cities in all of Europe. Much of that is due to the fact that there are over 50,000 students there. I thoroughly enjoyed my time—whether people watching at a café, browsing local produce and seafood at Grote Market, or taking in live music at a park. Groningen is indeed a unique city for many reasons, but the most obvious reason is hard to miss. I’m seriously not overstating this fact. Groningen is FULL of bicycles. Everywhere you look and everywhere you go, people are on bikes. Young kids, ladies in their 80s, college students, delivery men and women. 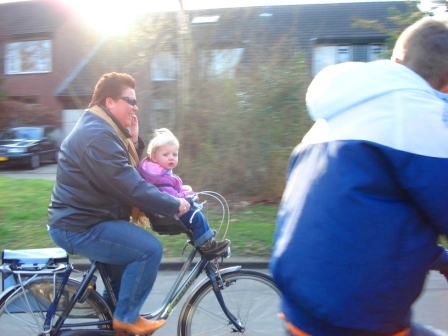 Sometimes there are two people on one bike; other times there are babies sitting in the front of the bike while mom or dad pedals. At times I also saw one person pedaling her bike while holding onto another bike on the side. I spotted students biking with their suitcase rolling alongside them. And people on bikes transporting furniture. Or why not take the dog for a walk? In Groningen, people are creative with their bikes. They are also instinctive. Bikes have their own roads separate from cars. They even get their own traffic lights. But that doesn’t mean that traffic jams don’t occur. It’s amazing to watch as cyclists enter intersections from four different directions at the same time, weaving past each other and avoiding pedestrians, the city bus, and any other obstacles. The first couple of times I saw this [and experienced it on a bike] it was quite overwhelming and I wasn’t sure if we’d all make it out alive. But somehow we did and somehow everyone knows when to slow down and when to speed up, and how to share the tight spaces. Sitting atop the forum overlooking Grote Market, Maria and I could see this from above; it was pretty cool. How did Groningen become such a bicycle-dominated city? It was an intentional effort. In 1977 the local government instituted a unique traffic management strategy. Cars were required to use routes that were mostly external to the city center. Groningen transportation authorities separated car traffic into four areas, making cars exit the center of the city and go around the perimeter. In short, driving a car in Groningen became very inconvenient. Enter the convenience of the bicycle. Though businesses resisted such a move, the movement went forward. Today more than half of the 360,000 residents of Groningen use a bike as their main mode of transportation. And it pays off to bike in Groningen, because parking your bike is easy and free. There are plenty of bikes-only paths, roads, and streets. Cars always have to yield to bikes. The main train station of Groningen provides more than 10,000 spaces for parking bikes. Further, when boats pass through in the canals, the bridge raises so they can go through. Cars and pedestrians have to wait. Cyclists, however, in some locations, do not wait. There are twin bridges that flank the raised bridge which are high enough so they don’t have to be opened. So if you’re commuting to work or school, grab a bike. Watch this short video featuring a Dutch engineer explaining the all-green light that bicycles get in Groningen. Notice what she said at the end of the video. People on bikes, when they are crossing intersections from various directions, make eye contact with each other, communicate in the open air, and figure out how to share the space, who goes first, etc. This is intentional, for sure. Consider that if half of your city’s population is constantly making eye contact with each other, communicating in public, and creatively sharing space. This makes for a positive environment. I experienced that in Groningen. People were used to interacting with others. People were friendly, helpful, patient. They smiled a lot. They were healthy. Kids were safe. Crime extremely low. On a bike, everyone is equal. An Indonesian Muslim woman in her hijab; an African man in his colorful dress; a businesswoman in a formal suit; a pack of teenagers side by side; a five year old biking with his grandpa. When Maria and I rented bikes and journeyed around the city, both of us experienced the interactive nature of Groningen transportation. It’s common to make eye contact with others, to talk, to connect. While riding the bikes, we could still fully experience the sights and sounds of the city, noticing all the details of each street and neighborhood, and smelling the food of cafes and markets. I do think that Groningen establishing itself as a bicycle city is wisdom. Let’s look at wisdom In religious texts–often portrayed as a female persona. We should, however, keep in mind that our limited perspectives about gender need not apply in this case. Unfortunately, we often associate male images of G-d with strength, power, and certainty, while the few female images of the Divine are of mothering and sensitivity. But ancient Hebrew texts like Proverbs and the Wisdom of Solomon present a more nuanced view. Wisdom is in indeed female and a representation of the Divine, but strong, certain, powerful, beautiful, excellent, superior, and mighty. Wisdom may be hard to define, and perhaps the lofty images of wisdom we get in religious texts and philosophical works deter us from seeing it as a real thing. But wisdom is a recognizable thing. When you encounter wisdom, you know it .It is when you integrate knowledge and experience and come to a deep understanding that helps you to navigate the difficulties of life. Simply put, wisdom is when we tolerate the things that are uncertain in life [accepting that we don’t know everything] and when we deal with life’s ups and downs in a healthy and balanced way. Wisdom helps us be optimistic about life—even the problems we face. Wisdom helps us to see the bigger picture, to personally reflect, and to develop as people. There’s a reason why the word enlightenment includes wisdom within it. Wisdom and light are often interchangeable symbols. When someone is wise, she “sees” the light or even emits light herself for others to see. Of course, Jesus of Nazareth was a wisdom teacher and a light himself. He encouraged all people to listen closely to wisdom, to love it actually, and to recognize the light and wisdom in themselves. I think we need to reclaim this, for the world is in need of wisdom; all of us are in need of wisdom. We tend to get so caught up in the other things of life that are not wisdom. We stray from the light because we get distracted so easily. And yet, wisdom is available to us. It’s in our sight, it’s in reach of our hands, it’s visible and accessible. Wisdom is not hidden from us. Wisdom is even innate in us. Friends, this life is hard. There are many moments of uncertainty. There are ups and downs; there are times of great sorrow and pain. There are moments when we just don’t know if we can make it. There are difficult decisions and unexpected challenges. And yet, the light of wisdom can provide you with tools to navigate and travel through this complicated world. But you will need to make eye contact with people. You will need to pay attention to the details, smell the smells, feel the breeze, hear the sounds, and appreciate life itself. May you find wisdom under a rock, in split wood, on the streets and sidewalks, sitting at your desk at school or work; at home, on the road, and in yourself. May wisdom be the home to which you return and may it be light for your decisions, comfort through the storms, and patience in the uncertainty.